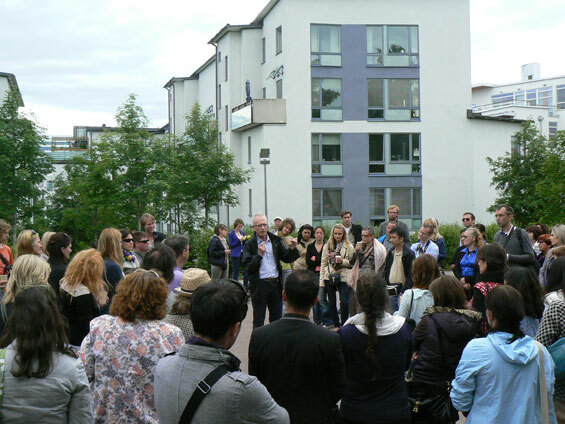 The EFLA regional congress named ‘Green infrastructure, from global to local’ took place between Saint Petersburg (Russia) and Stockholm (Sweden), Uppsala (Sweden) and Helsinki (Finland) between the 11 and 15th of June after the General EFLA Assembly. From the beginning the organizers’ aim was clear : introducing a long-term infrastructure vision, building cooperation with numerous events, presenting interesting contributions and strengthening the EFLA network. Arriving in Saint Petersburg is a change of scene: not only the streets are built on a large scale, but also the underground transport network is impressive and the buildings appear as majestic remnants of the Soviet period. 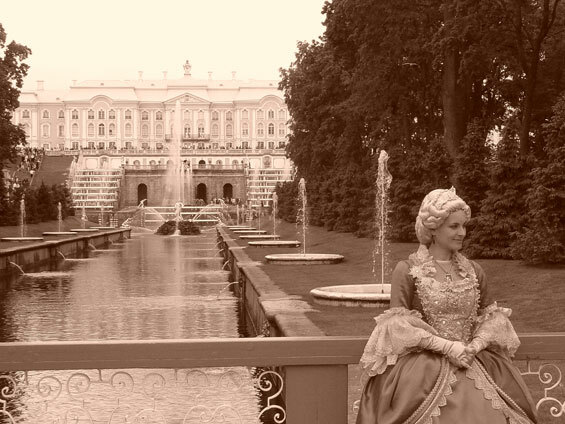 No wonder that the congress began in Saint Petersburg as five previous and successful congresses occurred in this town. In this context, the Marble Palace suited perfectly the holding of a congress with attendees and lecturers from all over the world. Alternating keynote presentations with short presentation sessions and site visits (through three countries nonetheless! 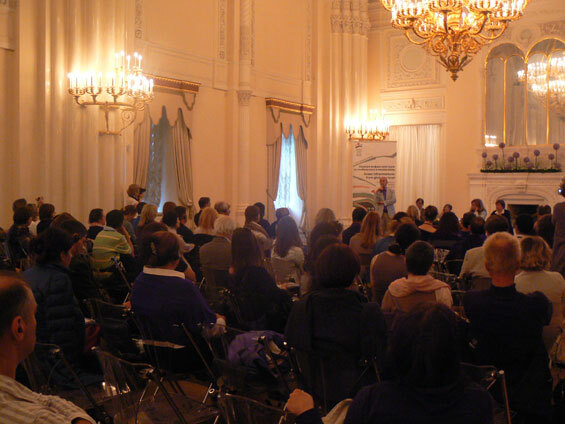 ), the congress provided wide-ranging and thorough material to participants. One of the first topics was the Urban green infrastructure for climate benefit by Nancy Rottle, from the Department of Landscape Architecture at the University of Washington (USA). Living in a rapidly urbanizing world, predicted climate change effects could dramatically impact our lives : summer droughts, stronger winter storms, rising sea levels… ‘Planners and designers are challenged to find solutions to help prepare for the inevitable impacts that existing atmospheric carbon levels are predicted to cause, while also promoting practices that will minimize those levels and therefore potentially reduce the severity of effects’1 Ms. Rottle presented several practices, especially regarding stormwater management. Water harvesting, cleaning and re-use can reduce energy used to pump water, or can maintain the full climate-mitigation function of vegetation while being integrated in the landscape. use green as a platform to bring dead and living neighborhoods together and bring death back to nature. as the use of living greenery. In fact, advertising with green has a very positive connotation and will be used more and more. After two days of congress in Saint Petersburg, it was then time to take the Allegro train. Direction: Finland, Helsinki. 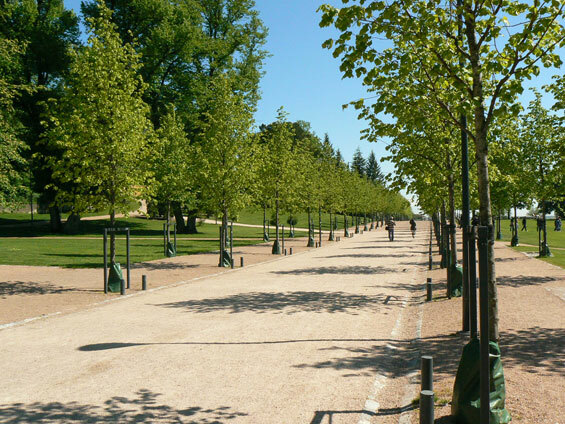 Walking in the Kaivopuisto park, on the sea front, was the occasion to discover other landscape management methods. The boat trip between Helsinki and Stockholm was an ode to nature, with marvellous landscapes visible in the early morning. is also facing urban pressure: more and more people are living close to its borders. This is a real problem because the estates are more valued than the green areas by the city planners. That, and its importance relating to climate change, is why the ecosystem must be protected. to its original form, people became involved in issues like tree felling and identifying which trees needed to be felled or pruned. battle took place during several days and the situation became to be dangerous, but the trees defenders won. This event led to a change in the opinion, and even the park administrator had to quit. The news made it to frontpages all over the world. 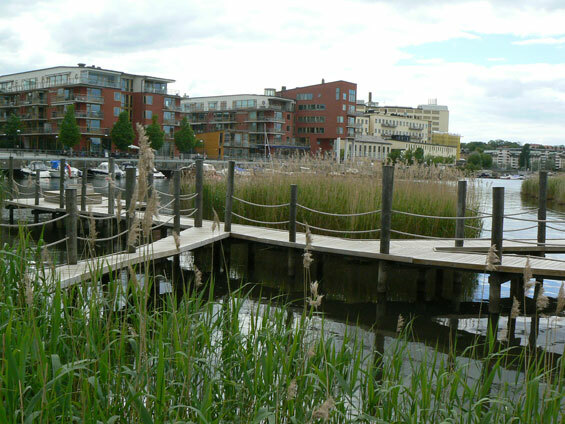 throughout this area is known worldwide as “The Hammarby Model”. 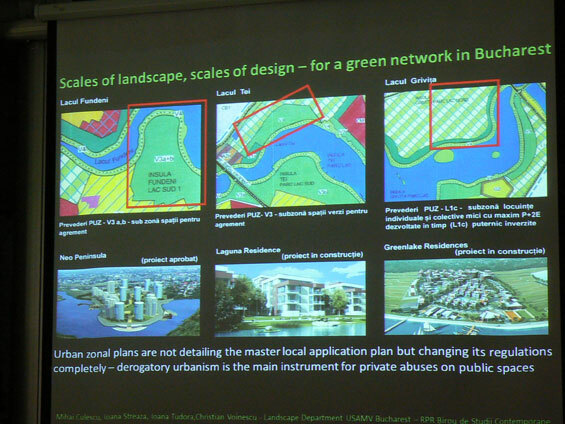 The presentation Scales of landscape, Scales of design – for a green network in Bucharest by Iona Tudora was without any doubts the most sarcastic one with the dramatic example of the development pressures of Bucharest, where nearly everything natural is demolished to build a house or a parking lot. This lack of vegetation is even to be found in the private gardens. This Romanian team investigated the creation/recreation of a green network in the town and determined three categories of further green networks elements: the local , urban and territorial scale. Regarding the other side of Europe, the landscape architect Frédéric Dellinger talked about the Green infrastructure and stormwater management in a city center with the example of Lyon, third largest city in France. Instead of leading the rainwater to the pipes, it stays in the green infrastructure by three possibilities: raingardens, underground water treatment passing through tree substrates and reinforced grass pavements. This risky challenge has been a success; the local politicians accepting such a trial in collaboration with local service managers, although they are more used to a very vertical management system in order to work across disciplines. Another French colleague, Olivier Damée, spoke about the improved quality of life thanks to new urban landscapes along the tramways, in his presentation Public transportation and green infrastructure : a new city for its inhabitants, the case of tramways in France. The topic of ‘Green Infrastructure’ is of world-wide importance and this was beautifully encapsulated within the title of ‘From Global to Local’. Thus, the topic could not fail but to register with all landscape architects and allied professionals in the built environment. 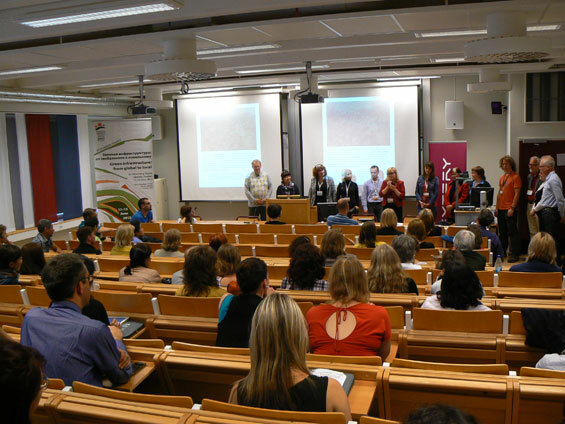 The range of presentations and the choice on offer throughout the conference programme was truly impressive.’. The congress concerned indeed not only green heritage but also future constructions. Students were encouraged to present and professionals were encouraged to publish their papers relating to the congress. improvement of sustainable living conditions, while campaigning for long-term, well-thought-out solutions over short-term economic gain. This exchange platform showed us how different governments induce different ways to design. The local government is definitely a major key to achieving better blue-green infrastructure. Bit by bit, the situation is changing. The European Landscape Convention 2 has also become more powerful. Let’s work together for a better environment and see you at the next EFLA congress ! 1 LARISA KANUNNIKOVA, EFLA regional congress : Green infrastructure : from global to local, international conference proceedings, 2012, Saint Petersburg, Saint Petersburg State Polytechnic University Publishing House, 198 p.